Has your family been complaining that you are mishearing things? Do you think some people are mumbling? Or are you needing to turn the TV up more than your partner? If these things are happening to you, don’t worry – it could just be that your hearing isn’t functioning at its best. And a hearing aid could help alleviate this problem. Hearing aids are amazing and it’s helpful to have some knowledge about the type of hearing aid you want. To do this, it’s worthwhile to compare the different brands to see what they have to offer, because, like cars, there are lots of brands, styles and models, with all types of features. In the table below you will find a comparison of Widex vs ReSound hearing aids, and what all their features can offer you. If you need some guidance in working out the best hearing aid for you, Hearing Choices can help. These two manufacturers have released 5-star hearing aids that perform at the top of the range. Let’s see how their features compare. Starting with rechargeable batteries – while both Widex vs ReSound hearing aids offer rechargeable batteries, ReSound outperforms Widex with their Lithium-ion rechargeable batteries. Lithium-ion are preferred over Z Power options due to the longer lasting charge and portable charging case. Widex vs ReSound hearing aids have excellent Bluetooth streaming capabilities. Both companies have hearing aids with direct streaming to iPhones, and through a device for Android users. Widex is reported as having the best sound quality for Bluetooth streaming in the EVOKE hearing aid. This is due to Widex’s Bluetooth technology providing a clearer signal, with both streamed speech and music. ReSound’s LiNX Quattro uses sixth generation 2.4 GHz Bluetooth giving superior full spectrum Bluetooth streaming for any smartphone. This means you can stream from just about any audio source and experience clearer speech and fuller sound. The specific Music Mode in the LiNX Quattro, allows all the nuances of high and low notes to be heard, providing beautiful layered music quality for your ears. If we now compare artificial intelligence (AI) we can see that Widex vs ReSound hearing aids both have great technology in this category. Currently, Widex has the best AI on the market as it utilises Machine Learning capabilities through SoundSense Learn in the EVOKE hearing aid model. The technology in the hearing aid allows a sound map to be created. It does this through the wearer’s experience – analysing feedback, remembering hearing preferences and learning from each experience. It constantly adapts to the changes in the wearer’s listening environment to enhance their current real-life hearing settings. 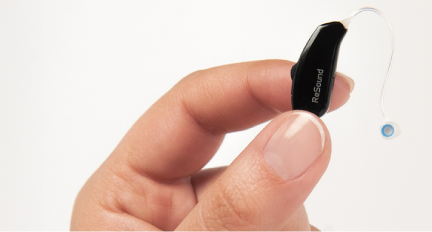 ReSound uses AI in the LiNX Quattro and has become the first smart hearing aid released to pair with Apple’s Siri assistant. Just ask Siri to turn up the volume in your hearing aid – hands free! Telehealth functionality is only available in ReSound models, with the ReSound Assist model. This is one of the best telehealth programs on the market today so for Widex vs ReSound hearing aids in this category, ReSound is a clear winner. Tinnitus programs and Telecoil functions are available in both Widex vs ReSound hearing aids and both brands offer a variety of hearing aid styles. The technology available in the Widex vs ReSound hearing aids comparison, is outstanding. Widex has the best AI with Machine Learning in the EVOKE hearing aid. ReSound has the best Telehealth capability on the market today and uses the preferred Lithium-ion rechargeable batteries. Both brands boast outstanding clarity with their streaming due to their chosen Bluetooth protocols. No matter which brand you choose between Widex vs ReSound hearing aids, you’ll select a model that will give you exceptional features and outstanding sound quality.